World Of Birds has been raising baby hand-fed birds since 1984. We started with Lovebirds and Cockatiels, and they still remain some of our favorites. Baby birds are very similar to human babies in their care and upbringing. They have to be nurtured, fed, changed and cuddled with many times throughout the day. At the age of three to four weeks our baby birds start their life with us in our store nursery, where large windows let them see everything that is going on. Baby birds have little to no immunity when they are this young so contact with people and other birds is very limited for the first few weeks of their lives. At the appropriate age, their next big step is to our main playpen in the middle of the store. Here, everybody gets to watch them learn to interact with each other and develop their motor skills as toddlers. This is also the perfect time for them to meet and socialize with people. Ninety percent of our customers own more than one bird, making the socialization of their babies very important. A deposit is usually placed on a baby while we are still hand-feeding them; often times, before the eggs have even hatched! The new bird parents are encouraged to come to the store to visit as often as possible to bond with their new bird. The bonding period is a very important step. It makes the transition from our nursery to your home a pleasurable one. If you are too far to visit, no worries; we give lots of love to all our little ones. When the babies are weaned and eating on their own they are ready to go to their new home. We do not force wean our babies. 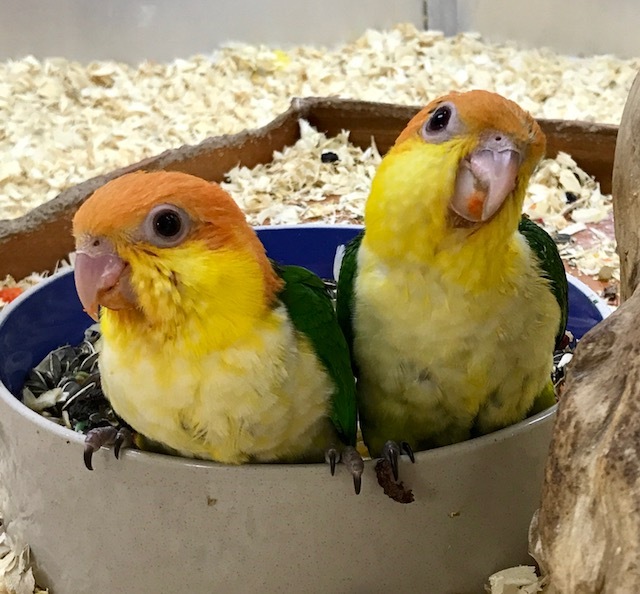 We offer millet, seed, pellets fresh fruits and vegetables until they are ready to leave the baby formula behind on their own. Enter your email below to be added to the email list for our newsletter. New Baby Birds always arriving! !